Omorfiá Cosmetics USA — Denv.Her. Want to glow like a goddess? PUH-LEASE! Who doesn’t?! “Omorfiá Cosmetics USA is a vegan, gluten-free, cruelty-free cosmetics company. At Omorfiá Cosmetics USA, we believe that gluten-free and vegan isn't just about what you're putting in your body, it's what you put on your body too. Your skin is your largest organ, and we believe that it should be treated with the utmost care and respect. Our products promise to bring you exceptional quality while also promising to be kind and healthy for your skin. Omorfiá Bronzer (Nakid): This powder bronzer is a neutral shade that can be used as a bronzer or even as a contour color. We used a light tap of Nakid over the entire face to warm up the skin and applied it with a kabuki brush. We then more darkly layered Nakid on the jawline and under the cheek bones for more definition with a countouring brush- get those features popping ladies! 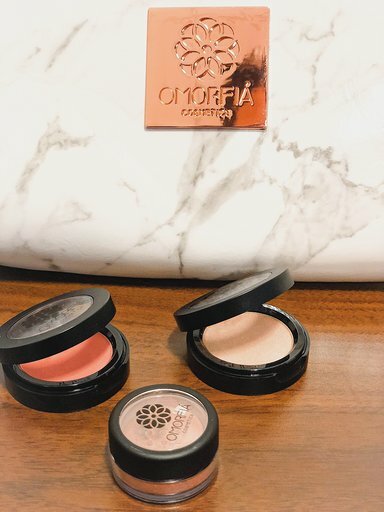 Omorfiá Blush (Nektar): Omorfiá’s powder blushes are gorgeously pigmented pressed powders that have incredible color pay off - it only takes a small tap with a fluffy blush brush to get beautiful flushed cheeks. Omorfia’s blush formula is V build-able so if you’re going for a more intense look, simply double tap your brush and layer more intense color on your cheek. Omorfiá Pressed Highlighter (Gloing) - The smooth pressed highlighter, Gloing, is a beautiful lit-from-within highlighter. This highlighter provides a subtle glow and is perfect for everyday wear. Look at that glow on the cheekbones! Omorfiá Loose Shimmer (Krem): Oh boy do we love the Krem sparkle #unicornsunite! Krem can be used as a loose highlighter on the high points of the face (tip of the nose, temples, and cheek bones), or can be mixed with a medium (Mac mixing medium or something similar) to create an ultra-foiled and creamy eye-shadow #yasplease! Omorfiá’s current product selection ranges from $22 - $26. Get your goddess on babes and further your makeup addiction with Omorfiá - you won’t be disappointed!